The microflora in your gut outnumber your own human cells by a factor of 10 to 1, and microbial DNA outnumbers your human DNA by 100 to 1. The gut flora has been shown to influence brain development, behavior, mood, immune system development, cancer risk, and cardiovascular disease, as well as many factors that influence body weight such as insulin production, appetite, metabolism, inflammation, and more. Unfortunately, we have transformed this once-thriving inner ecosystem into a polluted pond of fat-favoring microbes. Let's consider the evidence. There are numerous studies in animals and humans showing how eating a Western diet (high in fat and refined carbs, low in fiber) disrupts the balance of gut bacteria -- a shift that favors weight retention and fat accumulation. We also know that transplantation of gut flora from obese subjects into lean mice makes them become obese. Science is making it clear that gut flora plays an important role in weight gain. What is more troubling are the numerous studies showing how the overprescription of antibiotics in children portend to obesity and other diseases later in life. Why? The infant's flora directs immune system development and a less-than-robust microbiome may send the wrong message, leading to downstream problems, as many studies suggest. Despite these data, we have seen a continued rise of Cesarean sections, lack of breast feeding and overuse of antibiotics, all of which can detract from the establishment of a biodiverse gut flora and lead to childhood obesity. Antibiotics have long been known to make livestock fat, so why not humans? And it's not just antibiotic prescriptions that are causing problems. The work by Drs. Cho and Blaser has raised questions about passive acquisition of antibiotics in animal meats. These investigators used a subtherapeutic antibiotic treatment (STAT) model of obesity in animals and injected mice with the amount of antibiotics that humans consume in animal meat. The result? The mice that consumed the low-dose antibiotics over a period of time became fat despite eating the same amount of calories as control mice. So how can the disruption of gut flora by antibiotics lead to obesity despite the same caloric intake? The dysfunctional gut ecosystem (aka dysbiosis) becomes more efficient at extracting energy from food, so even though the animals do not consume more calories they absorb more of them from the food they do eat. Sound familiar? How many people tell you that they continue to gain weight despite starving themselves? The FDA reports of rising use of antibiotics in livestock despite the growing threat of antibiotic resistance requires executive action to combat. Luckily, several vendors are beginning to offer antibiotic-free meats, but it isn't enough. More action is needed. Gut dysbiosis can also slow down metabolism and cause weight gain in other ways worth exploring. One of the most important discoveries in modern medicine is the profound role that systemic inflammation plays in virtually every aspect of health. It is a contributing factor to cardiovascular illness, dementia, gastrointestinal disorders, Type 2 diabetes, and more. It also causes us to gain weight. Our Western diet promotes not only a disrupted gut ecosystem but also inflammation -- a very unhealthy combination. In fact, just 24 hours of a Western diet has been shown to shift the gut microbiome to a proinflammatory state. In obesity, the inflammatory process starts in the intestine. Inflammation in this area leads to a defective gut barrier. Once these junctions are loosened, bacteria-derived toxins enter the blood stream leading to insulin resistance, adiposity (fat stored in our fatty tissues), and weight gain. One of the most fascinating areas in the recent explosion of research on the gut microbiome shows us how our gut bugs talk to our brain and influence weight and health. Gut microbes communicate information to the brain via the hypothalamic-pituitary-adrenal axis (HPA) using enteroendocrine cells sending messages that govern insulin response and improve insulin sensitivity, slow gastric emptying, promote satiety, and reduce gut permeability -- all of which counter weight gain and obesity. It's clear that biodiversity in your inner ecosystem is essential -- and may indeed be a primary influencer -- in achieving optimal weight and health. 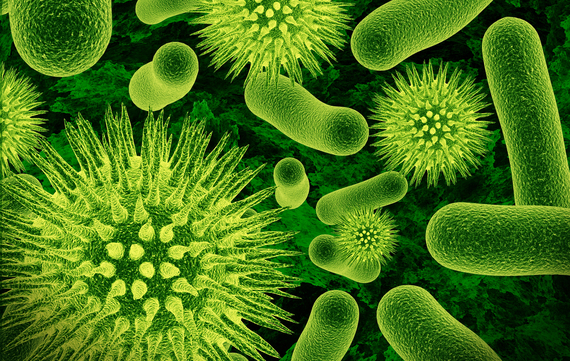 How do you enhance the biodiversity of your microbiome? Well, probiotics alone aren't the first-line agents. There is extreme variability in their quality controls, as many manufacturers do not fully comply with federal labelling laws known as Good Manufacturing Practices. I recommend using foods that establish and fertilize a robust gut ecosystem. Foodstuffs known as prebiotics fertilize the gut's friendly flora. A few examples are asparagus, artichoke, beans, garlic, root vegetables, and other foods rich in fiber. Fermented foods contain live bacteria that bolster fat-burning gut bacteria. Yogurt, kefir, kimchi, sauerkraut, and others will re-seed the gut with microbes that establish and enhance the biodiversity of the gut microbiome. Yes, I agree that our Western-based lifestyles have created the crisis, but for many it's not entirely their fault, as inflammatory foods are the most affordable, and obesity-promoting antibiotics are overmarketed to us and overused. We can change the "norm." Let us use this revolutionary new information about the gut microbiome as an opportunity to mend our health, promote well-being, and stem the tide of obesity.